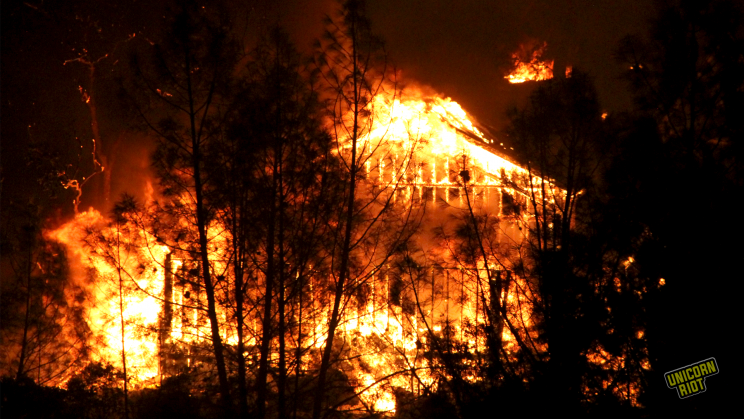 Butte County, CA – Dozens have died and hundreds are missing in the most deadly and destructive wildfire in California’s history. Unicorn Riot is in the evacuation zone documenting the unfolding disaster. The fire started five days ago on Camp Creek Road and has been officially named the ‘Camp Fire’. At just 30% containment, it is continuing to rage near Chico, and Oroville, California. 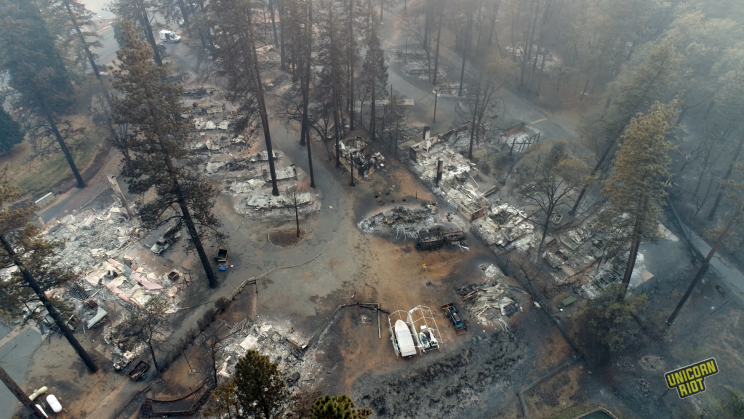 The isolated mountain town of Paradise, CA, approximately 15 miles from Chico, is now in smoldering ruins, with thousands of homes, businesses and vehicles destroyed. The nearby community of Concow was also similarly destroyed. 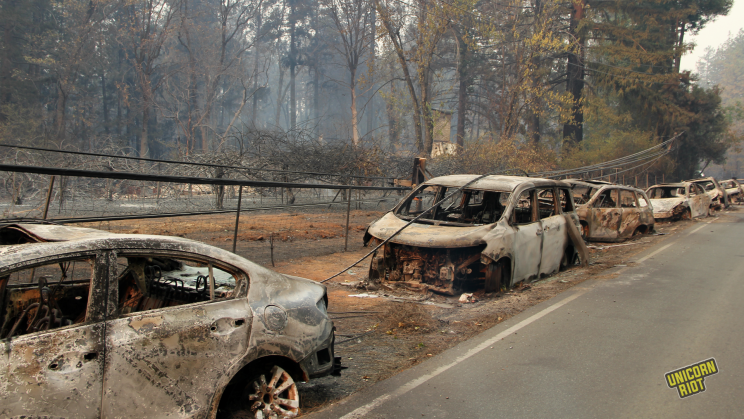 The current death toll is now at 42, according to Butte County Calfire. 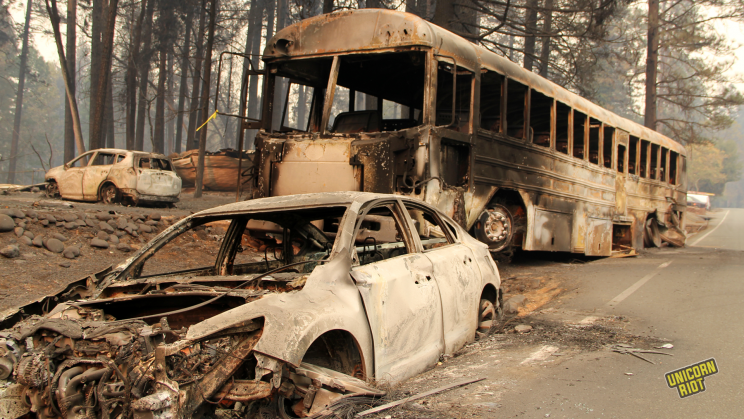 The number of lives lost is expected to rise as many of the structures and vehicles burned have yet to be searched. Many of the remains discovered were found in cars that were attempting to escape. Because of the high intensity of the fire, many of these remains are, so far, unidentifiable. As a result, anthropologists are being brought in from around the state to assist the local coroners in positively identifying the human remains. Hundreds of people are still missing, with the Sacramento Bee putting that number as high as 228. However, because of the ongoing confusion, and conflicting reports, the true number of people missing is still unknown. 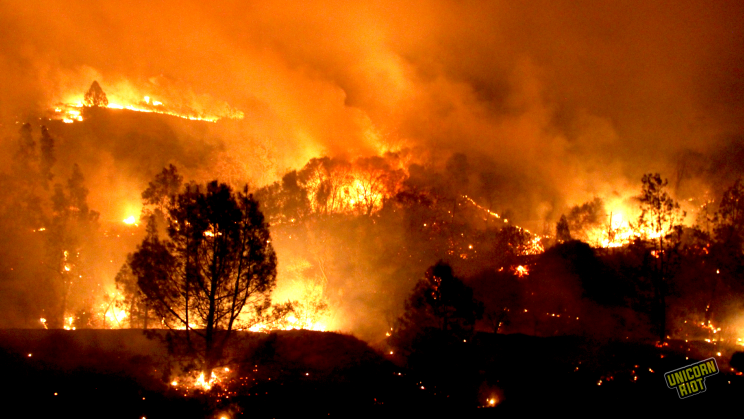 As of November 12, a total of 117,000 acres have burned, including over 6,400 homes, and over 250 businesses, according to Calfire. The cause of the fire is still officially under investigation. Some residents believe it may have been started by PG&E power company’s failing electric infrastructure, however that claim is still unverified by local authorities and the investigation is ongoing. 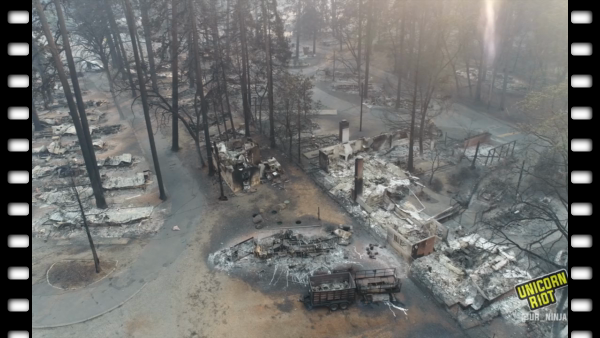 The Camp Fire is one of multiple major wildfires still burning throughout the state of California. Weather conditions and high winds continue to cause concern for the over 5,100 firefighters currently combating the Camp Fire. Unicorn Riot was on the ground this weekend and personally documented both the fire’s destruction in Paradise, as well active fires in the area. Our reporter on scene witnessed several homes burst into flames, large explosions, and huge plumes of black smoke billowing into the air above the structure fires. Air quality in the entire area remain dangerous, with many local residents wearing protective masks and respirators to mitigate the harm of toxic smoke. Community volunteers are coordinating ways to help and have organized community mutual aid meetings. Held nightly at Black Bird Cafe, a local bookstore, and info shop, a group of volunteers have been gathering to figure out ways they can work together in helping the effected. Mutual aid organizing included: efforts to distribute respirators, provide pet/livestock evacuation and care, help victims in obtaining lost documents, improvised shelter construction, ride shares out of town, clean up, ash sifting, free Airbnb’s, child care, donation drives, music benefits, creating contact lists, finding overnight parking accommodations and providing various types of medical and wellness services. Up to the date information was provided by and is available on Butte County Calfire’s website. Continue to follow Unicorn Riot as we will attempt to bring you more from the deadliest fire in California history.